There is a huge growth potential in the cannabis industry. It’s priming to add more than 414,000 new jobs to the market by 2021. In California alone, close to 100K new jobs will be available in the coming years, either directly in the cannabis industry, or somehow touching upon it. Not to mention the impact it’s had on Colorado, which boasts one of the lowest unemployment rates in the U.S.
Cannabis investors The Arcview Group and cannabis intelligence agency BDS did a study that projects that the whole marijuana sector is poised to grow from the current $16 billion dollar annual industry to more than $40 billion per year by 2021. That’s a 116 percent increase in just four years! So, how can you stake your claim in this booming industry? What types of careers are or will be available, allowing you to partake in the cannabis market action? And, what do you need to do to snag a job in this competitive field? In 2017, the state that had the most jobs in the marijuana industry was Colorado. But now that there are nine more states that have made marijuana legal, you will find opportunity in Los Angeles, San Francisco, Portland, Seattle, Miami, Boston, Chicago, and more. Michigan will likely have many job postings across the state, as will Alaska and Vermont. Additionally, 23 states have legalized medical marijuana, which presents many job opportunities, too. Work regulations may vary by state, as well as the facility you’re applying to work at. Because of the nature of the work, it may be nearly impossible to find a job in this market if you have a drug or felony charge. You may have to take (plus dish out the money for) a background check and drug test. You may also have to go through a relatively long process of registering with your state and/or city. And, because you have to be 21 to buy pot, you also have to be at least 21 to sell it in legal dispensaries. 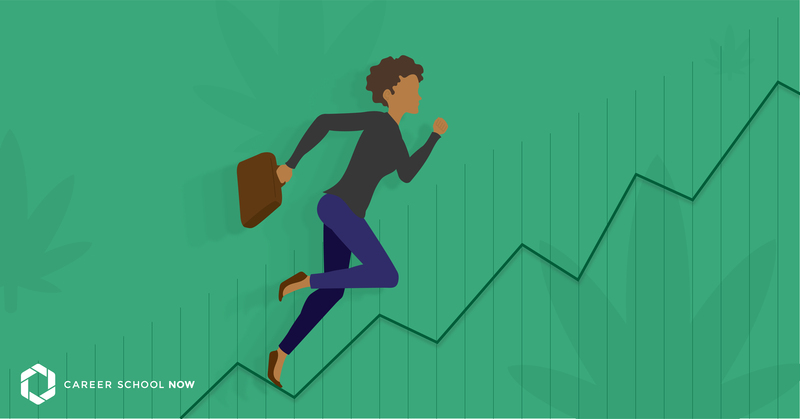 In many cases, you’ll need experience in the cannabis market, but there are also a lot of employers willing to train people they think are a good fit. Don’t dress the part of a stoner when going on a job interview. Dress how you would if you’re interviewing at a regular retail establishment. Don’t get high before you go in for your interview—and on the flip side, you don’t even have to be a pot smoker to find a good job in this field. Have a clean record and a clean appearance. Show off your skills related to the job you’re interviewing for, especially if your experience in the pot industry is lacking. You can be trained to understand the merchandise, but those other soft skills are so necessary to already have. Highlight things like customer service, bookkeeping, botanical, and sales. If you’ve worked at a startup or in the “green” industry, then those are added bonuses because cannabusiness is considered both. You can’t be in the medical or law enforcement fields plus work in the cannabis industry, for obvious reasons. Have a basic knowledge of the products the dispensary you’re interviewing at sells. Budtender: Cannabis consultants are the equivalent to a bartender. They help customers decide which strain of pot to purchase. You’ll need to know the bud industry, how the plants were grown, and how the products you sell were created, as well as have a retail-type background. You’ll need to be well informed about the rules and regulations of the marijuana industry on both the retail and medical sides. According to Glassdoor, entry-level budtenders earn an hourly salary between $11-$12. The more experienced will make up to $42K/year. This is one career slot most companies are looking to fill like crazy. A good budtender is not so easy to find. Edibles chef: You’re a whiz in the kitchen thanks to your post-secondary education in the culinary arts, and you’re worldly when it comes to marijuana due to your specialized interest. Combining the two skills means you make the meanest edible concoctions, guaranteed to delight partakers. You are also well aware of the strict yet ever-changing industry laws for testing and selling product, and you know how to properly measure extracts for a safe and delectable consumer experience. You’ll earn between $40K-$90K/year, says Glassdoor. Director of extraction: You will oversee all the extraction technicians who work in the facility with you. You’ll test the products for quality assurance and quality control, ensuring you’re producing the best marijuana on the highly competitive market. You’re also going to have to make sure all the equipment is in working order. You’ll develop operating protocol, set a production schedule, as well as track all your orders. You’ll need a bachelor’s degree in chemistry, food science, or another related career. The average annual salary is more than $92K. Extraction technician: You’re the whiz who can turn a plant into hashish, oil, or other types of extractions. You should have an associate or bachelor’s degree in chemistry, natural sciences, biochemistry, or engineering. Because you’ll be working in a lab, you need to have the experience and background in order to get the job done. Starting out, you’ll earn between $20K-$40K, but with more experience leading to a leadership position, your salary will hit six figures. Cultivation director: You have an associate or bachelor’s in an agricultural field such as crop science or farm management. You’re the master grower of the cannabis crops. You maintain protocol and keep lots of documents on the harvest, strains, combinations, and more. You’ll train apprentices and supervisors so that you can actually take a break now and again. Your salary will be $60K-$150K, depending on where you work and what state you’re in. Dispensary manager: You’ll be overseeing the day-to-day at a headshop. You’ll be dealing with the vendors, as well as the law. You’ll hire and train staff, keep stock in supply, and basically run the place like you would any other retail outlet. Very often, bachelor’s degrees are preferred. You’ll earn between $60K-plus and $100K depending on where you work and how much retail experience you have. Growth/botanical specialist/gardener: This position of many different names is responsible for growing hardy species of cannabis plants. You’ll oversee the the trimmers and fill in for supervisors when they’re away. You’ve been trained how to run the show, but you also know how to grow a great marijuana plant. Your average hourly pay is $15.55. Bud trimmer: You’re a super-specialized gardener, hand-trimming those plants in order to produce the best buds. You may be responsible for weighing, packaging, and labeling the plants. There may also be a certain quota you’ll be expected to make, and your pay will be based on that. Being a bud trimmer is a great way to step into the cannabis industry; many work their way up from this position. There are no education requirements, but you will need a Marijuana Worker Permit and be at least 21 years old. You’ll earn between $12-$13 per hour, or $100-$200 per pound of pot picked. Colleges and trade schools are offering courses and degrees focused on the marijuana industry. You can get anything from a certification to a doctorate, and these programs are offered at real, accredited trade schools, colleges, and universities. Cannabis: Yes, you can get an actual degree in cannabis by majoring in medicinal plant chemistry focusing on marijuana over at Northern Michigan University. More colleges and universities are adding curriculum and majors to their schools since it’s such a growing industry. There is no easy path; the classes you are going to take are tough. Biology: Biology includes the study of plants in botany, genetics, and horticulture. This makes a perfect education track if you’re interested in growing different strains of cannabis for the retail or medicinal marijuana industry. Marketing: As more states make marijuana legal, companies are going to be looking for ways to get their name out there. The various forms of marketing are a main way to be seen in print, online, and anywhere potential customers are. Since it’s a growing industry, stake your claim while it’s hot. Agriculture: An agribusiness degree is a great fit for you if the plan is to start a cannabis business or work with one already in existence. You’ll learn about technology, law, business, and agriculture, all important aspects of running a cannabis business, as well as a farm. It’s only a matter of time before weed is legal in every single state. Because of this fact, there are many people looking toward different facets of the cannabis industry as a career. This means, it’s going to be a competitive field. So, if you know you want to work in the marijuana industry, then your time to start your training is now.